We created a suite of presentation design solutions for use at various public events, involving several different audiences: stakeholders, government educational bodies, local businesses and parents. All presentations should tell a story – and have a beginning, middle and end. 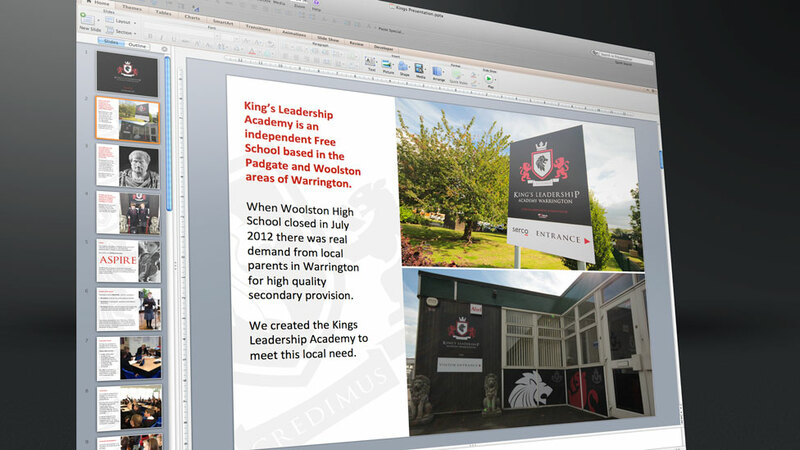 Having designed a trustworthy and inspirational identity for King’s Leadership Academy, we were then asked to create a suite of Powerpoint design slides for use at various public events – events which would involve several different audiences including stakeholders, government educational bodies, local businesses and parents. When using Powerpoint slides to accompany a presentation, it is important to drive home your key points with pictures as well as text in order to maintain your audience’s interest. We based the slides on three templates and, using carefully edited influential library shots from world famous Greek philosopher Aristotle, we featured children from the school’s own photographs alongside them. Maintaining consistency with font, size and corporate palette on a PowerPoint design gives a more professional appearance, as does good contrast between the slide background colour and the text colour. All Powerpoint slides are also Windows compatible for ease of adaptation if used internally. Finally, we mirrored the first and last PowerPoint slides with the Academy’s prospectus to ensure a consistent feel and reinforce the Academy’s professional standing in the academic field. 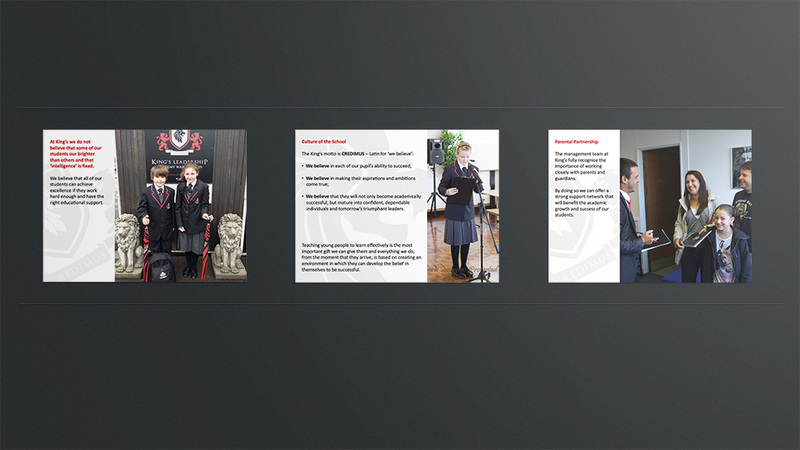 Parker Design now has a wealth of experience creating PowerPoint presentations for schools and businesses so why not get in touch so we can discuss your needs? We created a trustworthy and inspirational school logo which instills confidence in the local community and a sense of aspiration amongst students. Our print design team delivered a striking school prospectus design that successfully communicates the institution's mission and aspirational values.